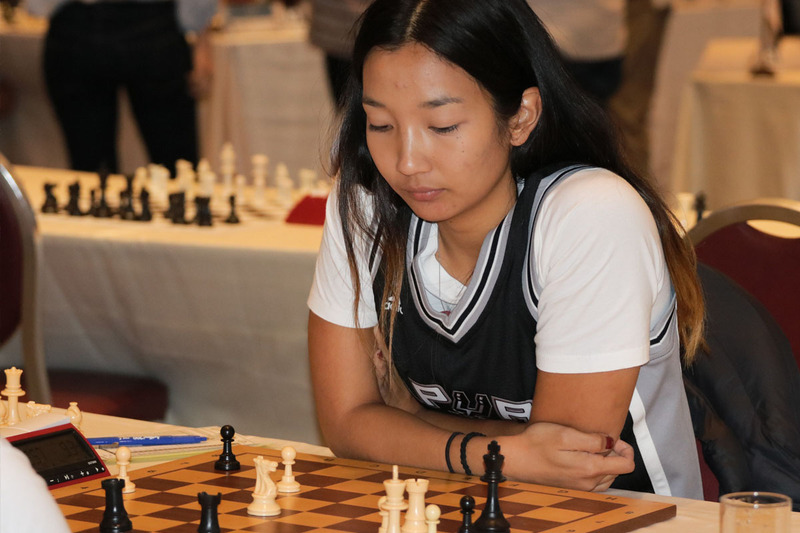 The Bangkok Chess Club’s annual open tournament has become a fixture on the international chess circuit and attracts people from all corners of the globe at all levels from amateur to 2700+ rated grandmaster and is popular with Australians as one of the best open tournaments in Asia. 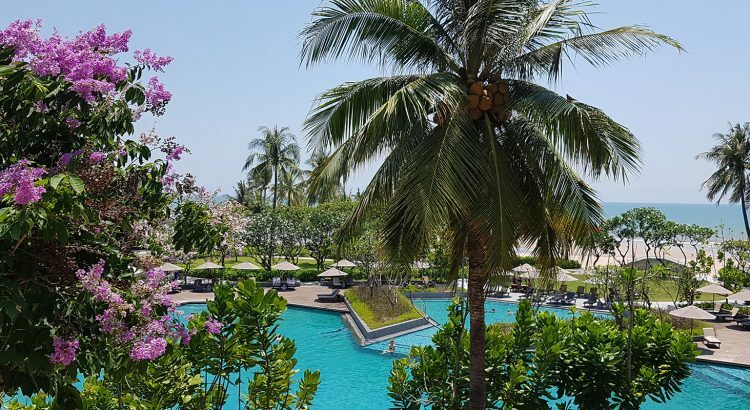 ￼The 18th edition of the Bangkok Chess Club Open saw 276 players from 37 countries gather at the Regent Resort on the Cha Am foreshore in Thailand from 13-21 April. Australia was well represented with 12 players in the main Open tournament including grandmasters Anton Smirnov and Moulthun Ly (seeded 6th and 12th respectively) and a further two in the Challenger event. 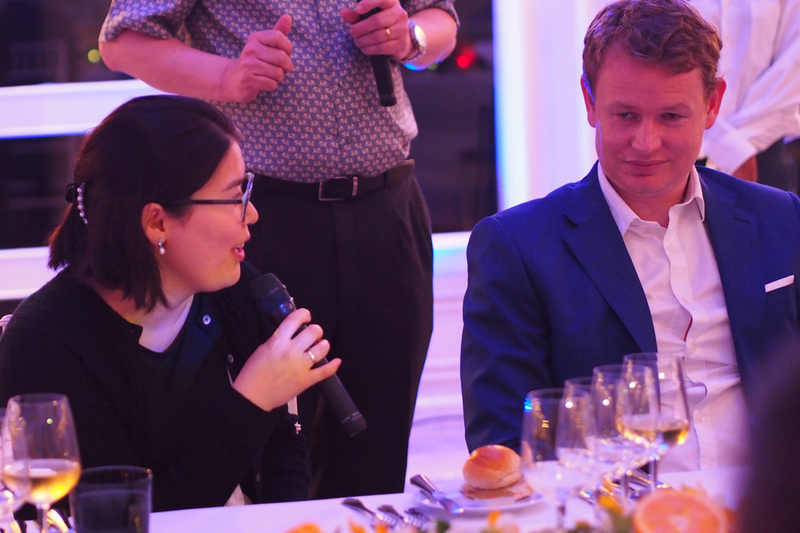 There was also a good deal of interest in how Olympian WIM Emma Guo and talented junior Albert Winkelman would perform against consistently strong opposition. Honorary Australian WGM Irene [Irine] Sukandar was also expected to feature prominently on the higher boards. Firstly, the evergreen English veteran Nigel Short was back to defend the title he won at the same venue last year. Always a popular figure in Thailand, Short is the prime target of those wishing to be photographed with a famous grandmaster, and readily obliges. A three-time winner of the tournament and having been in good form throughout 2017, Short was expected to mount a strong defence. • Secondly, the towering German Jan Gustafsson had returned once more to the tournament he has described as “the best of the year” in pursuit of a second title to add to the one he secured in Pattaya in 2011 on tie-break. • The top seed, however, was Armenia’s Hrant Melkumyan (ELO 2669) whose many successes in European events led him to be the most favoured participant to lift the trophy. 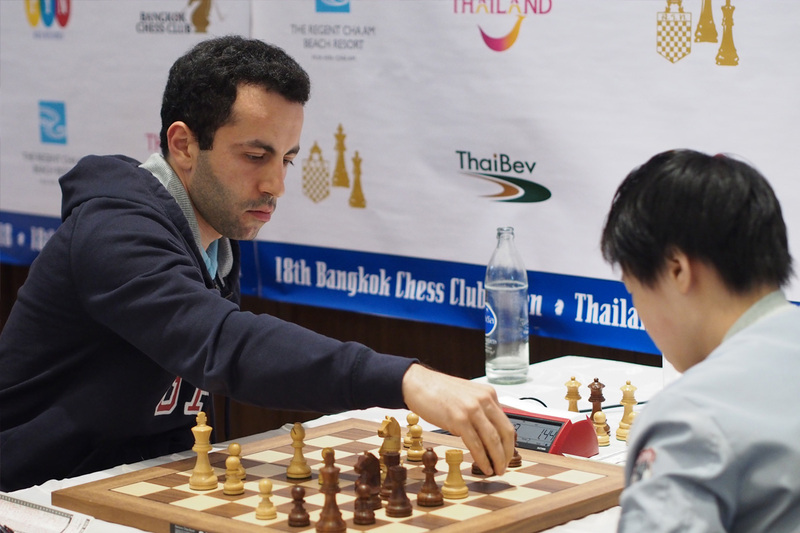 A repeat visitor to Australia in recent years, Melkumyan reminds observers of the young Kasparov, with short dark curly hair and a strong board presence. This tournament regularly sees young juniors featuring prominently in the opening rounds. This year’s event was no exception, with two Indian juniors making fast starts. The first to announce his presence was IM Raghunandan Kaumandur Srihari, who won his first three games after his opponents seemingly expended too much energy recording his name on their scoresheets. His more modestly named CM compatriot, D Gukesh (his first name really does seem to only have one letter in it!) was also quick to confirm his status as the number one player under 12 in the world. The three favourites also made good starts, as did the Australian grandmasters, with Moulthun winning his first three games, and Anton conceding only a draw in round 3. 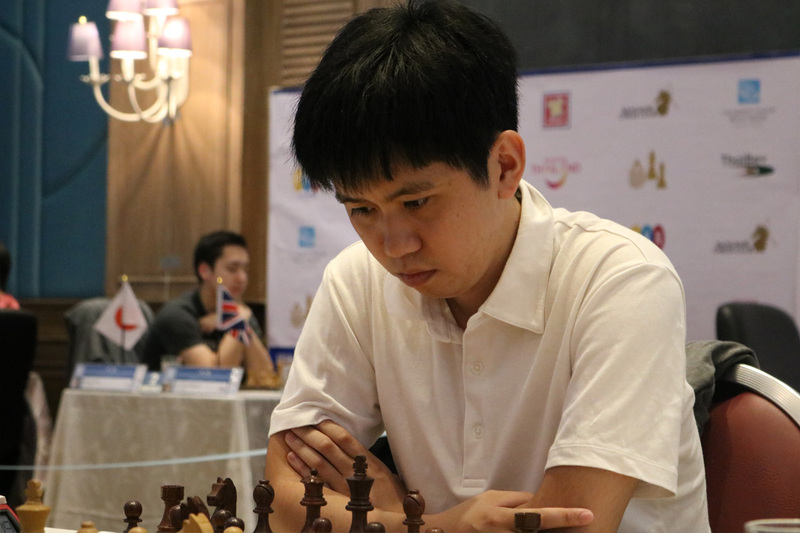 Of the leading contenders, only “Blindfold King” GM Timur Gareyev, fresh from his joint victory in the Doeberl Cup, suffered a serious setback, the fifth seed losing in round 3 to the untitled Chinese player Nie Xinyang. Round 4 saw the most talked about incident of the tournament. Short appeared to be on the verge of overcoming the determined resistance of Gukesh, having reached an ending with two extra pawns. Although the presence of bishops of opposite colours presented some technical difficulties, the Englishman seemed to be closing in on the full point. With a full five minutes remaining on his clock, Nigel made his move, and wrote it down on his scoresheet. He completely forgot to press his clock. The clock began to run down. Nigel, engrossed in the position, and assuming that his opponent’s clock was running, never again looked at the clock. Gukesh, keeping very still, watched the seconds counting down from the corner of his eye with mounting anticipation. Pandemonium broke out when 0.00 finally appeared on Nigel’s clock. Eleven-year old Gukesh, unable to contain himself, jumped up and down in excitement next to the table (“in glee”, the vanquished GM later said). Short, in a state of shock at his oversight and anger at his opponent’s conduct, marched out of the room, leaving the scoresheets unsigned. It is understood that no-one stopped him to ask for a photo on this occasion. The Australian grandmasters continued to quietly progress and each stood on 3.5/4, perfect scores being held at this point only by Gustafsson and the Argentinian GM’s Diego Flores and Krysa Leandro. 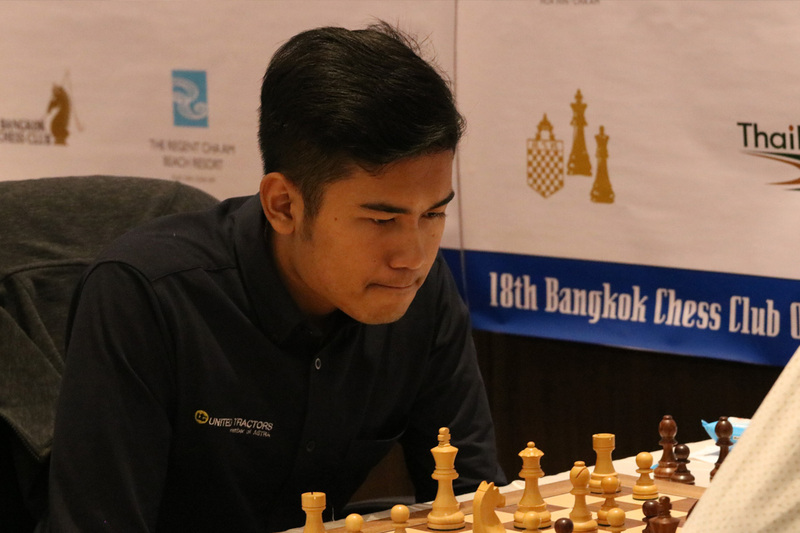 Round 5 saw the star game of the tournament when Anton launched a spectacular attack against Irene Sukandar, which catapulted him into a share of the lead. Moulthun had to defend carefully to hold the increasingly confident Gukesh to a draw. 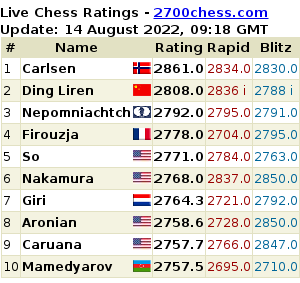 It is striking how composed the Australian GM is when playing, even when under pressure. 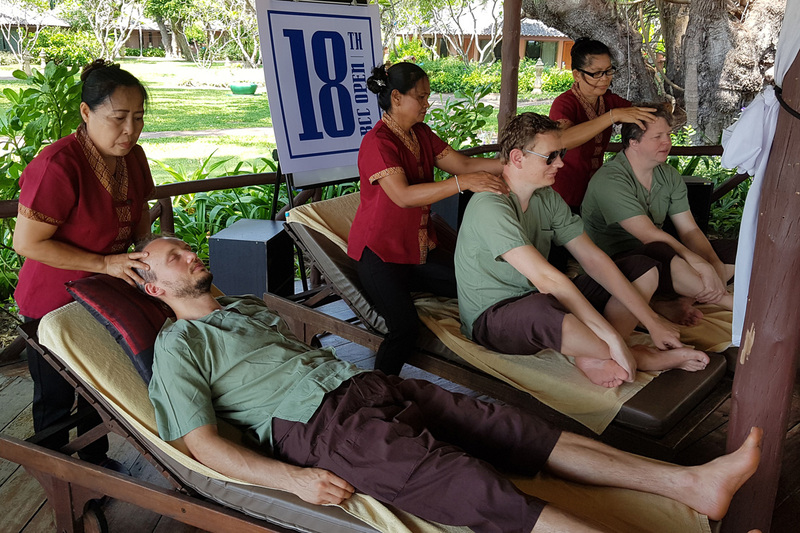 There was less animation in Moulthun at the board than in the monks meditating nearby in the Cha Am temple. One suspects his natural serenity is a key asset to his chess in tense moments. It was also interesting to observe the two marquee players in action. Nigel Short wears a near permanent frown when playing, and looks constantly worried and fidgety. He seems rather like a schoolboy who is grappling with a maths problem that is far too hard for him. Jan Gustafsson’s fine positional sense enables him to know exactly where to place each piece, but he is at a total loss as to where to put his exceptionally long legs. One moment they are wrapped around his chair in the manner of a python strangling its prey, and the next they are flung off to the side and hoisted against the wall. He would benefit greatly from a false floor in which to deposit his bottom quarter. Spectators eagerly awaited the Board 2 clash in round 6 between Smirnov and Gustafsson, but they had to be quick, the game lasting little more than an hour when Gustafsson misplayed the opening. This round was also notable for Emma Guo’s second draw in the tournament against a GM. Meanwhile, Moulthun experienced a setback when he fell to promising Indonesian FM Novendra Priasmoro, who was in the middle of an extraordinary run that would elevate him to the highest boards. Everyone expected Melkumyan, with the White pieces, to take control of the tournament in round 7, but he was unexpectedly upended by the irresistible Priasmoro, who extended his winning streak to six after beginning the tournament with a draw against a 1900er. This result fully justified Smirnov’s decision to take a quick draw as White against Gareyev, as the Australian was now only half a point behind the sole leader, and would be paired with him in round 8. 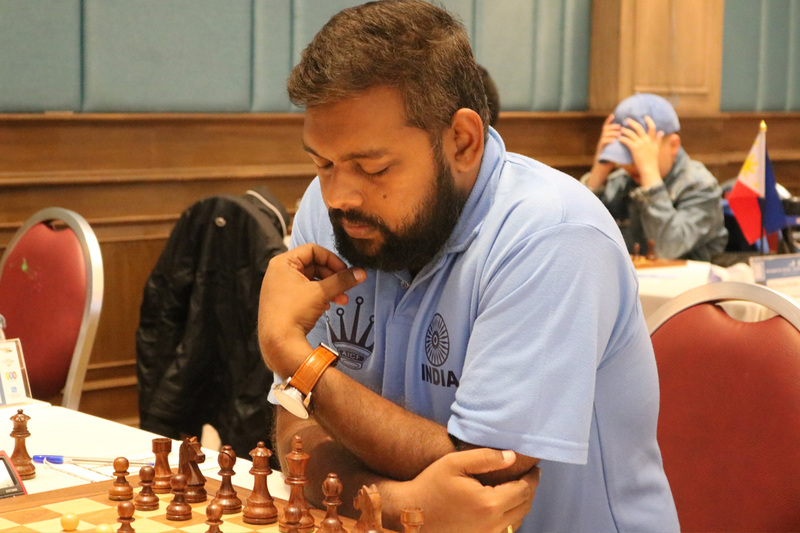 Meanwhile, Indian GM Chakkravarthy Deepan joined Anton in second place with a win over FM Zhu Yi of China. Round 8 began with all Australian eyes fixed on the top board. 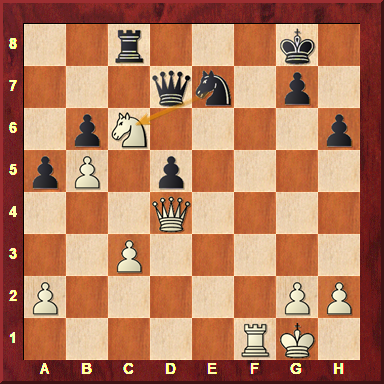 Anton reeled off the first dozen moves of his French defence almost without thought and was clearly still in his preparation. 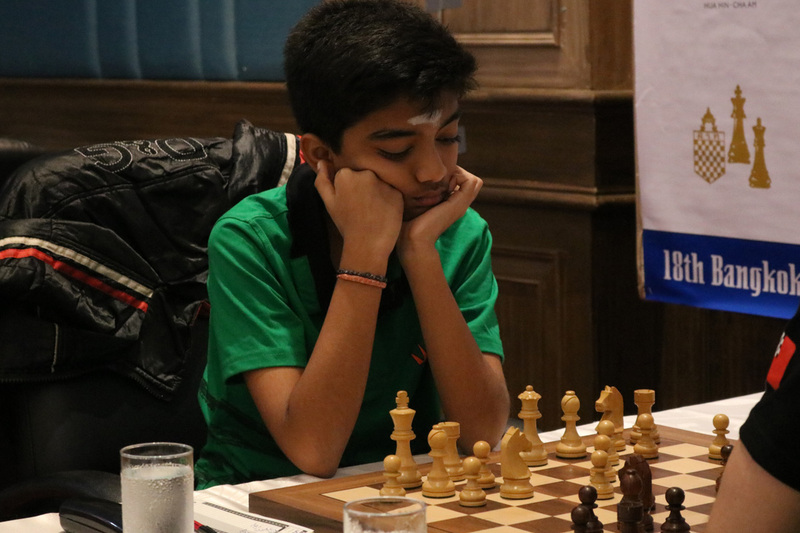 Novendra was consuming some time but finding good moves, and the Australian was struggling to equalise. Under pressure, Anton missed a beautiful shot which decided the game immediately. A lovely move. One of those combinations that is easy to spot if there is a pawn on f7, but is easily missed when the invader lands on an empty square. Moulthun completed a bad day for the leading Australians by also succumbing in a highly tactical game, but Nigel Short, his equanimity fully restored, completed a fourth straight victory to charge back into a crowded tie for second. He was joined by Garayev, Deepan, Gukesh, Nguyen and Andyka. However, all these players were a full point behind the surprise leader with just one round to play. When the draw for the last round was published, the pairing Priasmoro must have feared was confirmed. Nigel Short, who prides himself on his ability to win when it is most required, would have the chance to tear down the leader at the last moment. Short played a French Winawer, and Priasmoro repeated the 5 Bd2 variation which had succeeded the day before. 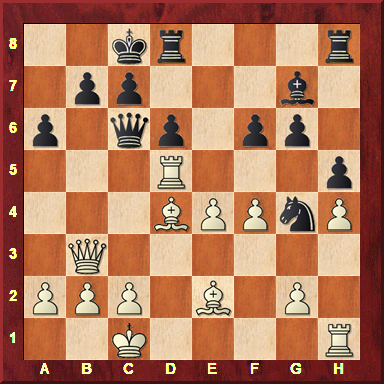 A typical French structure with a backward pawn on e6 emerged. It was very deep and easily defended, but had the effect of tying down Black’s pieces. Unable to activate his army, Short offered a draw after two hours of play, which was gratefully accepted, and a new champion was acclaimed. The 19-year-old Priasmoro is obviously considerably stronger than his 2449 rating and FM title suggests. He had already satisfied the requirements for an IM title before this event, and can now look forward to his apparent destiny as Indonesia’s next GM. Of the pursuers, only Deepan succeeded in winning and thereby securing sole second place. 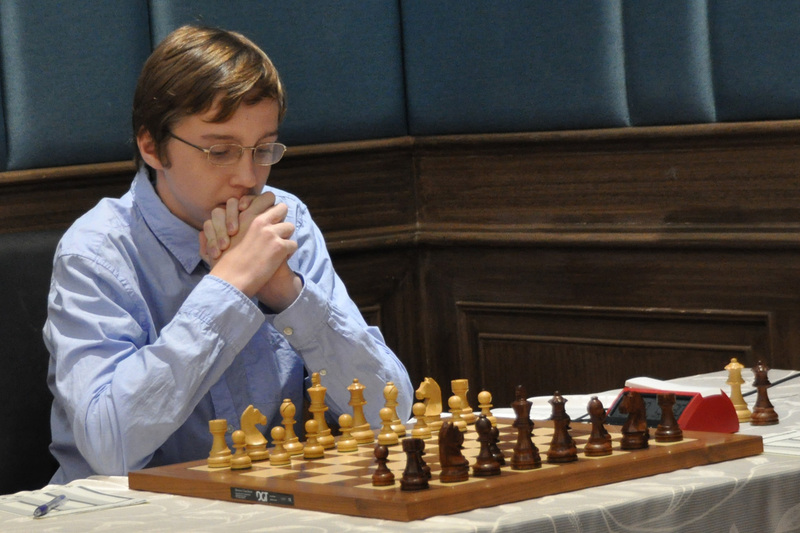 Anton was unable to convert a huge time advantage into a win, but Moulthun showed fine endgame technique to break down what had appeared to be a solid fortress in a long game. Of the other Australians, Winkelman fully justified high expectations by scoring 5/9 against a strong field, a performance that will net him 87 ELO rating points. However, even this was topped by veteran Farbood Ali, whose 5/7 in the Challenger will lead to a 99 point rating jump, and young Jacob Chan, who added 94 points. It is hoped that an even larger Australian contingent will journey to the Land of Smiles for the 19th edition and that our grandmasters can go one step further and add a fourth Australian name to a trophy already adorned by the names of GM Ian Rogers, GM David Smerdon and GM Zong-Yuan Zhao.